Remove from heat and add eggs 1 at a time till well blended, add 2 ounces cubed cream cheese and beat vigorously until batter is smooth. Pipe top layer over the filling taking care to leave no open spaces. Place in preheated, 400 degree over and bake for 30 minutes, reduce heat to 350 and bake additional 5 minutes. The first time I ate Profiteroles was in a charming bed and breakfast, The Painted Lady, in Old Colorado City, Colorado Springs. My business was just two blocks away so it was easy to slip out of work and have lunch with the ladies. Time after time, I would order these delightful gems after eating a fabulous lunch. Unfortunately, the Painted Lady Bed and Breakfast closed it's doors. Sadly, I felt cheated out of my sweet lunch indulgence, or so I thought. I began dreaming about my favorite meal from this lovely restaurant; Profiteroles and the Fettuccine Alfredo (dessert first, has always been my motto). My dreams are in technicolor and I have the ability to taste what ever my dreams bring to me in the night. After several mornings waking with the taste of profiteroles covered in hot fudge sauce, lingering in my mouth, I thought it was high time I tried to make this fluffy French dessert myself! I was so please when my first batch came out perfectly! Profiteroles are a French dessert made with Pate A` Chou, a light pastry dough, used for cream puffs, eclairs and other fabulous sweet finales. Pate A` Chou can be filled with a variety of decadent creams and sauces. Profiteroles are generally filled with ice cream, Creme Patisserie or Creme Chantilly. This recipe is my dessert entry for Paula Dean's, Real Women of Philadelphia cooking contest. 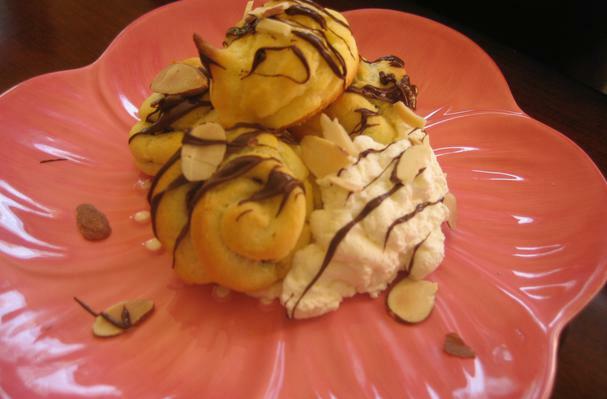 I've added cream cheese to the Pate A` Chou and stuffed the profiteroles with chocolate morsels and cream cheese.